Kit our your Company branding with these sensational Sport Bags with Logo Printing and you'll be amazed with the increase of sales you'll recieve. Tough and durable, our draw-string Sport Bags with Logo Printing are suitable for carrying trainers, football boots, your kit, shirts, and more. Pick and choose your colour choice from Black, Mid Blue, Blue, Red, Grey, Green, Yellow, Orange, Pink, Purple, and personalise with your own Company / organisation logo branding in either 1 colour or a 4 spot colour printing process - great for your business theme. Whether you're in the sports industry or perhaps you own a Gym, why not gain some great exposure with a fantastic vbusiness gift such as our Sport Bags with Logo Printing!.. 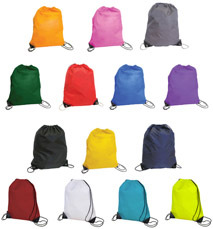 For a FREE QUOTE, please fill in the form regarding our Sport Bags with Logo Printing and we'll be able to help you. Why not have a look a our other branded sports bags below?